of banks, corrupted politicians and triad connected property developers and between people doing desperate things. i think (?) mostly were about mainland Chinas clamp-down on democracy in the former free British Crown Colony. exciting to see what type of films the director Ho Hong will make in the future. financial district, an older man is burning his belongings, protestors fill the streets and 2 youths are robbing a bank. It takes some time to connect these scenes but finally all the story lines meets in the final scene. protesting against this and that, but they need money and plans a bank robbery. the Triads supplying the violence. A common phenomena in the wild west unhinged capitalistic China today. A Great opening but maybe a somewhat less great finale of this film. Still a Good film with lots of promise. 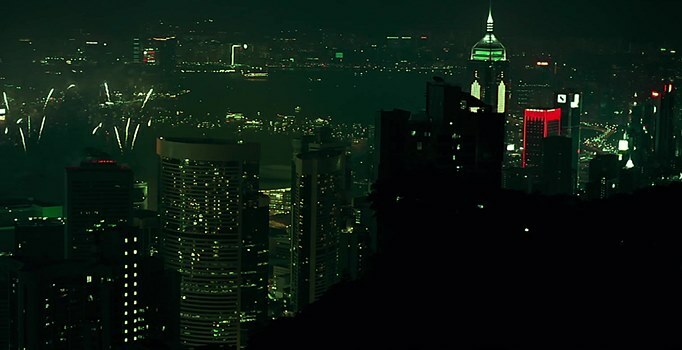 living in skyscrapers are the most memorable from this film. Kudos to cinematographer Cheung Siu-Keung.